Leonard Bernstein is one of the best 20th Century American composers (not to mention pianist and conductor, as I learned last year). His Candide is stunningly beautiful, but based on Voltaire's 18th Century satirical novel, it's a bit... weird. 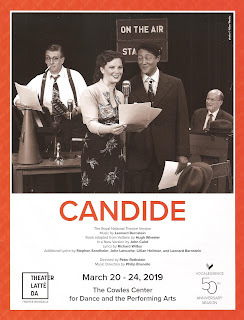 Twin Cities vocal ensemble VocalEssence and music-theater company Theater Latte Da have combined to solve this little problem, and bring us all of the best of Berstein's Candide. Director Peter Rothstein has a way of tweaking a piece just enough to bring out its purist truth, and he's done that here. With a short rehearsal time and just one weekend of performances of this "theatrical concert," he has staged it as a 1930s radio play, complete with sound effects. The result is something clever, charming, not too weighted down with plot complications, and musically stunning. Sadly the entire run is sold out, but I heard a rumor that they're selling standing room only tickets at the door if you want to take a chance to see this charmingly rendered and musically delicious production of a classic. This was my second experience with Candide, having seen Skylark Opera's production a few years ago. But even if you're not familiar with it, you would likely recognize some of the music (particularly the luscious Overture), so well known and oft performed it is. I'm not going to get into the epic plot twists and turns here; suffice it to say we follow the journey of a young man named Candide from youthful optimism through the most horrible things a person could endure, arriving at a place of contentment. And it's a comedy. The ridiculousness of the plot (people dying and coming back to life, fantasy worlds filled with gold) is perfectly suited to this radio play, as the narrator (the divine Bradley Greenwald, who I wish would narrate everything always) leads us through it and glosses over a few things, with a wink to the audience. He and the cast also create all sorts of sound effects, eliminating the need to have all of the fantastical things mentioned appear on stage, while going one step beyond a simple reading. The intrepid "Gofer" Andrew Alness manages all of the sound effects paraphernalia smoothly; Bradley puts out his hand and the appropriate sound effects tool is there. It's fun to watch, but also tempting to close one's eyes to get the full effect of imagination the sounds create. The richness of Bernstein's score is brought to full effect by the 50+ member VocalEssence Chamber Chrous and Ensemble Singers, with music direction by Philip Brunelle. They're accompanied by a lovely 14-piece orchestra, and several featured singers (including Phinehas Bynum as the title character, Liv Redpath as his love Cunegonde, Elizabeth Hawkinson and Rodolfo Nieto as their childhood friends, and Susan Hofflander as the old woman with one buttock). The sound is truly glorious, and the beautifully restored Goodale Theater in the Cowles Center is a wonderful space for it. The songs are incredibly intricate and pleasing to the ear, as well as funny and at times profound. "The Best of All Possible Worlds" and "Make Our Garden Grow" are highlights and the most recognizable. The a capella section in the latter song rivals the ascending notes of "An Ordinary Sunday" from Sunday in the Park with George for the most thrilling musical moment in music-theater, at least judging by the chills it induces. A moment so beautiful you want to close your eyes and stay in it forever. As per usual with a Peter Rothstein-directed piece, I find myself understanding it and connecting to it more than I have before. The ending brought tears to my eyes not just through the beauty of the music, but through the beauty of the message. This is definitely not the best of all possible worlds, nor is it the worst of all possible worlds. It's just the world that is. And none of us are pure and wise and good all of the time. We do our best to plant and cultivate the seeds we want to grow in our life. A wonderful message for this time of year, and for this time in our world. Those Edens can't be found. Are grown in solid ground. We'll do the best we know. And make our garden grow. And make our garden grow!